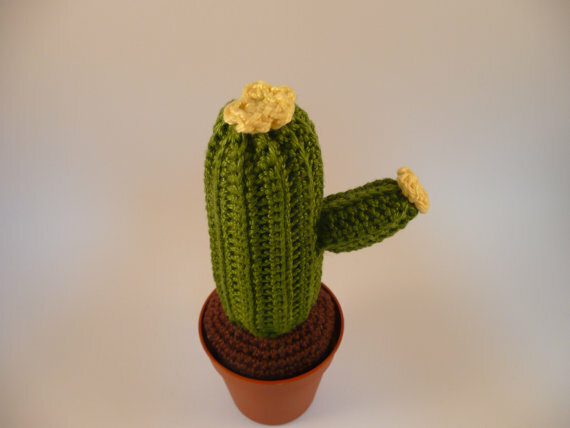 In rete se ne trovano moltissimi, ma di cactus amigurumi non ci si stanca mai! Perciò ecco la mia versione, ispirata a quella di Elf’s Dwarf (a sua volta ispirata a quella di Nadia). Qui scrivo il pattern in inglese, in fondo all’articolo troverete i pdf con ulteriori immagini in inglese, italiano e spagnolo, con immagini. In the net there are may of them, but we never tire of amigurumi cactus! So here is my version, inspired by Elf’s Dwarf (inspired by Nadia). Here I’m writing the pattern with images in english, at the bottom you’ll find the pdf with further images in english, italian and spanish. Please, if you find error of english in the pattern, write to me! En la red estan muchissimos, pero de cactus amigurumi nunca nos cansamos! Por eso pongo aquì mi version, inspirada de Elf’s Dwarf (inspirata de Nadia). Aquì pongo el patron en ingles, pero en el fondo del articulo està el pdf con màs imagenes en ingles, italiano y español. Por favor, si encuentras errores en español en el patron, escribeme! rounds with a slip stich unless indicated. Use a stitch marker to mark your rounds. Start at the bottom going up. With brown, make a magic ring, ch 1. Sl st in next st and fasten off. Leave a long tail for closing the hole: using the yarn needle, pass the yarn tail through the stitches of the last round. Gently pull to close. Weave in end. Flatten top and shape soil in the pot. Fasten off and leave a long tail for closing the hole: using the yarn needle, pass the yarn tail through the stitches of the top opening of the cactus body and pull to gather close. Weave in end and stuff. Fasten off and leave a long tail for closing the hole: using the yarn needle, pass the yarn tail through the stitches of the top opening of the cactus arm and pull to gather close. Weave in end and stuff. With yellow, make a magic ring, ch 1. 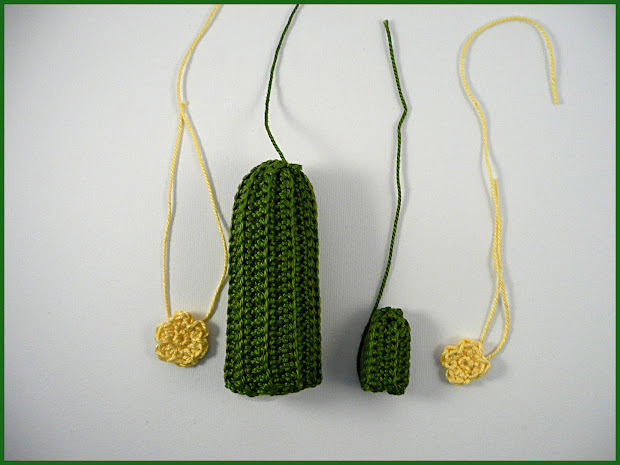 Fasten off and leave a long tail to sew the flower to the top of the cactus body. Fasten off and leave a long tail to sew the flower to the top of the cactus arm. 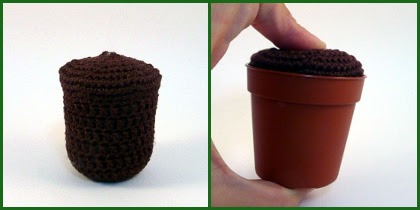 Sew the cactus body to the center of the soil, and the arm to the center of the body. Sew the big flower to the top of the body and the small flower to the top of the arm. gracias ! te agradezco mucho que te llegaras hasta aquí para decirme de tus patrones del cactus sos muy amable y gentil estan preciosos los que tejiste en cuanto disponga de un tiempito hare uno ahora te sigo desde mi blog un abrazo Sara. Hola Sara muchas gracias por tu comentario.